We propose you to practice with us from your home, on internet, using a software called zoom which works better than skype (which we started with). There is a web site dedicated to this practice: http://zazenathome.org Zazen@home is not the same as zazen in a dojo, but it has felt stronger than zazen alone, and can be a real help for people who are either isolated, or have a very busy family life, and cannot afford the time to go to the dojo. For example, knowing that somebody else checks your posture is an incentive to put energy in it. We sometimes broadcast recorded kusen from Master Kosen to create an atmosphere of concentration. 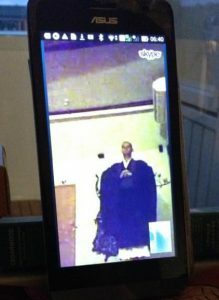 All our zazen are online; Sunday from 8:30 to 10:30, wednesday and friday from 6:00 to 07:15. We start the meeting 10mm before zazen, and anybody can connect during those 10mm. 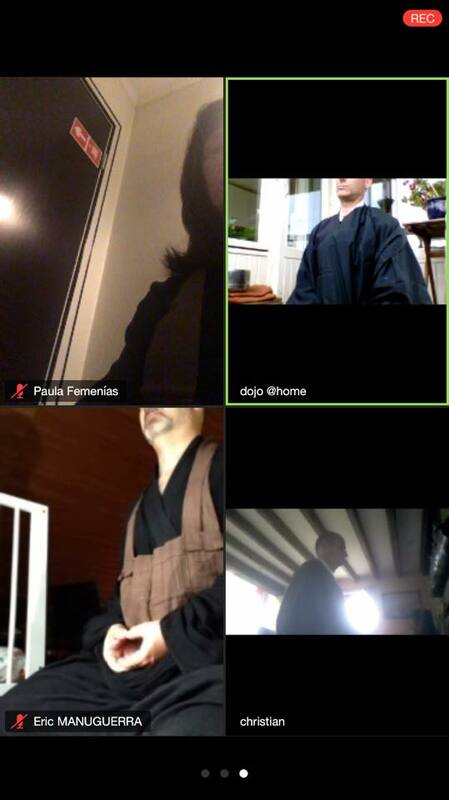 First zazen on zoom with Paula, Fred, Eric and Christian. You can Join from PC, Mac, Linux, iOS or Android using a fixed url: https://zoom.us/j/9070503010 (easy to remember). You install your phone tablet, or laptop, not in front of you but a bit on the side, so that it is not too invasive, and you still get the zazoom effect. You check that your posture is visible, also with respect to lightning, and you put gallery mode, to see all the participant’s posture. If you generate noise (children, Larsen), we’ll turn off your microphone not to disturb the others. We ’ll turn it on, for the Eko, the sampai, and the quick chat after zazen, when we fold the kesa. Zazen night, on December 30.